When is Six Flags Fiesta Texas least crowded? 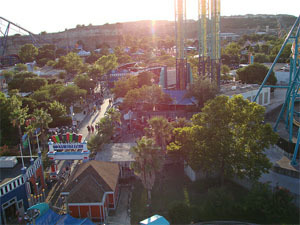 The second Six Flags park in Texas (the other being Six Flags Over Texas in Arlington), Fiesta Texas features 50 rides, including 8 roller coasters. The park is located in San Antonio and also includes White Water Bay, a separate water park. So when exactly is the best time to go to Fiesta Texas? The park is open from late March through January, and some days are busier than others. Here’s what the crowds look like throughout the operating season. Opening Day – Six Flags Fiesta Texas opens for the operating season on the first weekend of March, and crowds are usually manageable for the opening weekend. Spring Break – Schools in the area are out for Spring Break in mid-March. That means the park is open all week and it’s typically packed. Crowds are lighter on the weekends after Spring Break, especially on Sundays. Weekends – Fiesta Texas is open on weekends in April, and crowds usually aren’t too bad. Sundays are least crowded. Weekends – It’s not the summer season just yet. The park is open on weekends in May, and Sundays are again your best bet for lighter crowds. Memorial Day Weekend – Fiesta Texas starts opening daily after Memorial Day. It’s typically very busy over the three-day weekend. The park is open for a few weekdays before the holiday weekend and after Memorial Day, so try to go on those days for a lot less crowds. Summer Season – Six Flags Fiesta Texas is open everyday in June for the summer season crowds. The earlier you go in June, the better. Crowds start to pick up by the second week of the month. Weekdays are still busy, but usually less crowded than the weekends. 4th of July Weekend – The summer crowds are out in full force by July, and it’s typically very crowded for the 4th of July holiday. July is the busiest month at Six Flags, so there’s really not much relief from the summer crowds. If you must go, avoid the weekends. Weekdays – August marks the end of the busy summer season. More schools get back in session throughout August, so the later in the month you go, the less crowded it will be. Go on weekdays for smaller crowds. Labor Day Weekend – Six Flags Fiesta Texas gets crowded for the three-day weekend. Try to arrive early. The park is only open for a couple weekends after Labor Day, and it usually isn’t very crowded. Fright Fest – Fright Fest takes over on weekends in all of October. Attendance to the Halloween event is highest on Saturdays. Try to get there early in the day for more manageable crowds. Weekends – Fiesta Texas is open for the first few weekends in November, and crowds are typically light. Holiday in the Park – The holiday event starts on Thanksgiving Weekend and into January. Crowds are typically light to moderate, but do start to pick up after Christmas and into New Year’s Eve. Fiesta Texas is closed on Christmas Eve and Christmas Day. How were the crowds the last time you visited Six Flags Fiesta Texas? When do you think is the best time to go? Be sure to let us know in the comments below! I don’t think the crowds will be too bad then. The weather is usually around 60 degrees. We were there on October 24. Two and a half hours after opening, there was still a 200 foot line at the ticket booths. Massively long lines on every ride, as well as all 5 of their haunted houses, and still all the lanes and streets were flooded with people too. That’s odd, you’d expect opening weekend to be busy. Usually, how crowded is it during cheer and dance competitions? They usually make the park a little busier, maybe not as bad as the summer. I don’t remember it being too crazy on those days. Will it be crowded this Sunday April 16? Since its Easter, and Mexicans have vacations.? Yes, I’d be prepared for it to be fairly busy on Easter. Get there early! On Mother’s Day weekend is it best to go on Saturday or Sunday? I think Sunday would be better. How busy do you think it will be on the 4th of July since the Holiday is on a Tuesday this year?